This winery dates to 1980 and is known as the home of the annual California Wine Tasting Championships held every year since 1983. The winery's tasting room on Highway 128 is fashioned from the wood of a single 400-year-old redwood tree, is a valley landmark and can be easily spotted by the colorful flags waving in the breeze at the entrance and the large solar panels on the roof and next to the winery. The tasting room was designed by Aaron G. Green, a San Francisco architect who was an associate of Frank Lloyd Wright and the Father of Allan Green, the winery's owner. Allan's collection of canned wines (400+), which are displayed in the tasting room, is the largest of its kind in the world. The weathered winery is located on the top of Greenwood Ridge, seven miles from the tasting room. It has sharply angled roof lines and Arts and Crafts-style windows. 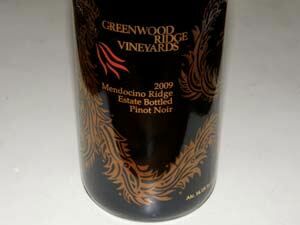 The winery was completed in 1986, six years after Allan first started making wine under the Greenwood Ridge label. Green graduated from college with an art degree in 1971, the same year his parents bought 275 acres on Greenwood Ridge. He became a viticulturist in 1973, when the family purchased an adjoining vineyard. Green adopted innovative pruning and trellising techniques to balance the effects of the cool climate and long growing season. 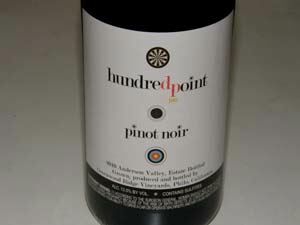 A small amount of Pinot Noir are made from the winery's 16-acre vineyard on Mendocino Ridge at 1,400 feet above sea level, and is sold on the website. 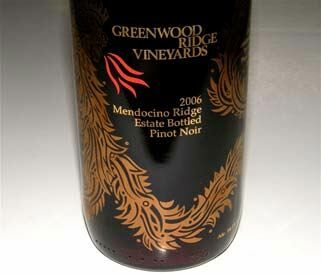 The Pinot Noir is consistently fine, reasonably priced and sells out yearly. The wines are bottled with a unique etched design on the front instead of a label. When Green's father died in 2001, Allen introduced a large stylized dragon to his bottles as a tribute. Frank Lloyd Wright had given the elder Green a dragon sculpture that Wright's wife rigged up to breathe fire from atop the rock on which it was mounted. That dragon is now displayed at the Wright estate Taliesin West in Scottsdale, Arizona. The tasting room in Philo is open daily. Picnic grounds are available. Production is about 2,500 cases annually.